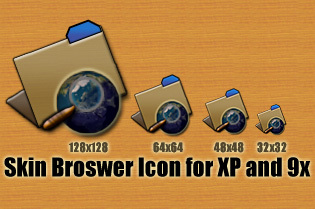 A very rough Skin Browser icon that I made for XP. It should do untill Stardock or somebody else makes a better one. I've included the .PSD file. Very cool. But what would a 32x32 and 48x48 version look like? Smaller . It *should* contain icons from 128x128 down to 16x16, all I did was to shrink the psd file down - the 16x16 looks terrible. I'll update it sometime this week.